Cash, 59, was out of the river at 8:15 p.m. He was transported by Jackson County EMS to Schneck Medical Center for evaluation. JACKSON COUNTY, Ind. — An investigation is underway after a White River boating accident in Jackson County, Ind. on Sunday, Feb. 10. Officers saved Jerry Cash, 59, from swift water after capsizing in the White River. There was a report of a man needing help at 7:42 p.m. Sunday near County Road 300 North and the Shieldstown Covered Bridge. Cash's neighbor, Tony Davis, was driving nearby when he heard his cries for help. "Every time it floods, I always make it a point to roll my windows down when I go over the bridge because you can hear so much," Davis said. "I just happened to hear him. By the grace of God, I heard him." Davis called 911 immediately as Cash continued to cling to a partially submerged tree. "Before I could get off the phone, they were here," Davis said. 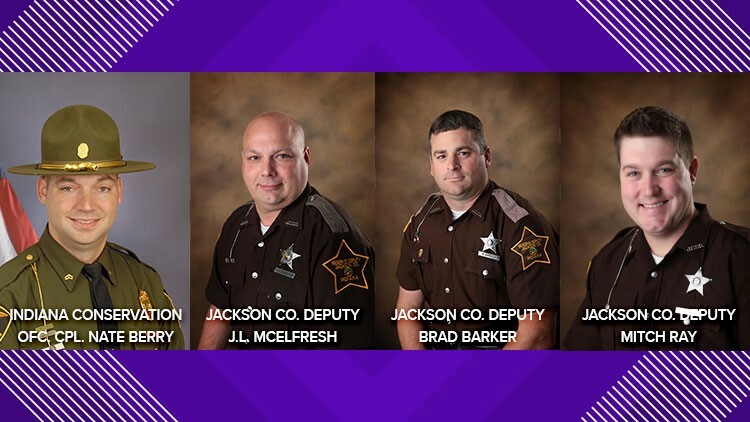 Jackson County deputies, J.L. McElfresh and Brad Barker responded and found Cash hanging on to that tree limb in 6 to 8 feet of swift water. Brownstown Volunteer Fire Department backed a truck into the water and Deputy Barker attempted to reach Cash with a throw bag rope, but Cash was too far away. Jackson County Deputy Mitch Ray arrived on scene with the Sheriff’s Department boat and Indiana Conservation Officer Cpl. Nathan Berry arrived with a department Airboat. Officers launched the Sheriff’s boat into White River and Indiana Conservation Officer Cpl. Nathan Berry operated the boat while Deputies Barker and McElfresh accompanied Berry to assist with the rescue. Officers then pulled Cash from the frigid water into the boat. "You could hear him yelling for help. By the time we got out to him, it was more of a distressed moan," Berry said. "He was just doing everything he could to hang on." "He wasn't able to help himself into the boat at all. He was in bad shape," Barker said. Cash was out of the river at 8:15 p.m. He was transported by Jackson County EMS to Schneck Medical Center for evaluation. Officers said a matter of minutes made all of the difference. "I was honestly very fearful that we were going to experience a first responders worst nightmare where you're there, you're trying to get to someone, and you watch them go under water. I think we were that close," Berry said. "I don't think any first responder left thinking that if we had been five minutes later, that we wouldn't have had a much different out come." An investigation showed Cash was trying to retrieve a canoe from along the river’s edge on property that he owned. It was during that attempt, he capsized and became stranded in the river. The conditions of the river were extremely dangerous due to swift current and large amounts of debris as a result of recent flooding in the area. Cash was not wearing a personal flotation device during the accident.